Learn more about San Bernardino, California using the City Guide below. Plan a trip, find local shopping centers, or just discover what makes San Bernardino, California so great! San Bernardino is a city in the Inland Empire in California. San Bernardino is the largest city in Southern California's Inland Empire area. The 2000 census shows the population to be 185,401. Of this, 45.2% are white and 16.4% are African-American. 27.1% is cited as "some other race", the majority of which is most likely Hispanic. The city, along with its outlying areas, has a large Hispanic and Spanish-speaking population. 40.4% of the population speaks a language other than English at home. San Bernardino can be accessed by any of several Southern California airports. 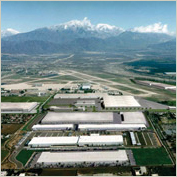 Ontario International Airport (airport code ONT) is located approximately 15 miles southwest of San Bernardino. It is serviced by most major airlines, including Delta, American, Southwest, Alaska Air, and US Airways. Los Angeles International Airport (LAX) is also an option for those willing to rent a car; at approximately 80 miles southwest of San Bernardino, it is too far a distance to use most forms of public transportation. Flights to LAX are predictably more frequent in number and more affordable than those to Ontario, but the convenience of Ontario can be an asset. McDonald Brothers Hamburger Stand. The original McDonald's, now a museum. Look for the huge red sign advertising 15 cent hamburgers which can't be purchased in the adjoining museum. Mitla Cafe, 602 N. Mt. Vernon Ave., ? +1 909-888-0460. Tu-Th 9AM-2:30 PM & 4:30PM-8PM; F 9AM-9PM; Sa-Su 9AM-8PM. Best Western Hospitality Lane, 294 E Hospitality Ln, ? +1 909-381-1681 (fax: +1 909-888-5120), $105-160 (Doubles). Econo Lodge, 606 N H St, ? +1 909-383-1188. $65-70. Motel 6 San Bernardino North, 1960 Ostrems Way, ? +1 909-887-8191 (fax: +1 909-880-9231). Motel 6 San Bernardino South, 111 West Redlands Boulevard, ? +1 909-825-6666 (fax: +1 909-872-1104). San Bernardino is a good launching point for Joshua Tree National Park, and lies halfway between Las Vegas and Los Angeles. Travelling to or from San Bernardino, California? Find flight to or from San Bernardino, California with an Online Travel Agency. Get lodging information or make reservations with a Local Online Hotel. Plan ahead and reserve a car with a Local Car Rental Agency. Are you relocating to San Bernardino, California? Goods & Services in San Bernardino, California.